Download your free copy of X-Ray Magazine #59 today! The latest edition of X-Ray Magazine was released last week and it is a fantastic edition, with lots of really interesting information; including a write up on diving in South Africa and diving the sinkholes of Namibia. If you haven’t already subscribed to this really great free, downloadable diving magazine, sign up for their newsletter to be informed today! 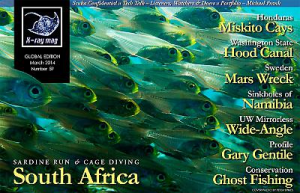 Every edition is jam-packed with interesting articles which include diving destinations, underwater photography, the environment; equipment reviews and more.